For several years I’ve read biographies and listened to interviews. Mostly from the business world. But also in the music industry. One recurring theme that continued to pop up was the fact that many people that are successful in creative fields and areas of life that are a little different were often the youngest child in their family. It’s certainly not a hard and fast rule. Plenty of people have been successful no matter what their birth order. Actually, in business it seems that many that are successful are the first born. It just seems that in creative fields, especially music, that the youngest often succeeds. I’ve been thinking about why this is and the more I think about it there are a few reasons. But the good news is that even if you’re the oldest or in the middle or whatever you can still break the traditional rules and find success in creative areas. Parents are obviously older with the last child than they were with the older siblings. People usually become more laid back with age. And once you’ve done something, like raise a baby and toddler, you’re more comfortable and confident. When the first born comes to a parent with a crazy idea, like wanting to be a musician, the parent is likely to freak out. When the last child comes and says it the parent is likely to just nod their head and say, “Go for it”. Also, when you feel like you’re loved no matter what you are freed up to do whatever you want. You know that your parents, family and friends will always love you. Parents usually love all their kids unconditionally, but they don’t always realize it with the first. They’re more worried about how their first born will make them look to their peers. Fear of failure is real. For everybody. But let’s say you’re the youngest… You see your older siblings do all kinds of things. You realize that they can fail and life will go on. They also realize it. So do your parents. So you’re more likely to feel that failure isn’t a big deal and your family will support you because they realize it too and want to encourage you to do well. Ok, that’s a little hyperbolic. Plenty of older siblings and middle siblings do great things and things they enjoy. But for some youngest siblings they definitely see their older counterparts become lawyers and accountants and bankers and realize that the normal way of life isn’t for them. So they figure out what they like. They invest time to get good at it and then they make it their job. Positive feedback is a good thing. Harvard found that people need six times as much positive feedback than negative feedback for good results in work and life. We don’t always realize that when we’re doing something for the first time, like raising a child. We tell the oldest what they’re doing wrong. With the subsequent children we let negative things slide and realize that if we encourage effort that it will lead to good things. Hearing that what you’re doing is good, like playing an instrument, leads to doing more of it and eventually you can get really good. The older children are the first to walk. The first do drive. The first to get a job. They do all the “normal” firsts. Maybe the youngest children are just looking to firsts that can be uniquely theirs. So they start digging around in the unique areas of life. A little bullying from older siblings can lead to resilience that could help with rejection that is common in life in general and especially with uncommon fields of work. 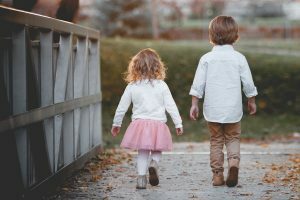 Youngest siblings may become better than their peers at things like sports and work because they’re always trying to keep up with their older siblings. Kind of the opposite of the last one, but in some cases it seems that the youngest has more patience. For example, the oldest sibling may get the best starting job right out of college. The youngest often seems to have the patience to try something unusual and give up the earning power in younger years in exchange for the possibility that they’ll earn more in the long run. Which often seems to occur. Older siblings and families often want to protect the youngest. This seems fine on the surface, but it can obviously lead to bad behavior including risky behavior because they feel they’re invincible because they’re not used to failing. But a good side effect might be that they try risky career paths that sometimes work out. If you’re in a creative field, like music, it’s often because you want attention. As the younger sibling, you’re competing against years of established relationships in your family for attention. That can continue into adulthood and doing something creative and different can be a simple form of trying to get the attention of your family. Now, these certainly aren’t universal rules. It just seems to be a trend. And these were some of the common things that matched up in my head for more than a few cases. The takeaway from this is to understand how unseen things could be holding you back from doing something that you want to do. Once you understand that most of the barriers you have in life are ones you put on yourself you can breakaway and do what you want to do.